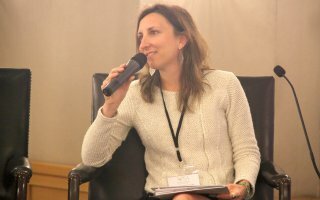 Delphine Dorsi, RTE’s Executive Coordinator, participated in the meeting ‘Financing Education 2030, revisiting the role of the civil society in Middle East & East Europe’ that took place in Beirut, Lebanon, on 1-3 May, 2018. The conference, co-organized by the Arab Campaign for Education for All (ACEA) and others, aimed to merge civil society efforts in the region and co-construct a regional strategy for securing financing for the achievement of Sustainable Development Goal 4 (SDG4). In a panel discussion about 'Opportunities and gaps in financing of education in emergencies situations', Delphine gave a presentation through a human rights lens on 'Public versus private: the challenge of access to free education during emergencies'. The presentation was based on the work RTE has done over the past years on the privatisation issue in analysing international law that applies in that context. RTE has also monitored the impact of the involvement of private actors in education on the right to education, and is facilitating with partner organisations the development of human rights guiding principles clarifying states’ obligations in the context of privatisation. Delphine highlighted states’ obligations in regards to the right to education in the context of emergencies (particularly on free education and financing). She also mentioned key human rights principles that apply regarding private actors’ involvement in this context, referring to the draft of the Human Rights Guiding Principles on States’ obligations regarding private actors’ involvement in education, currently under development. 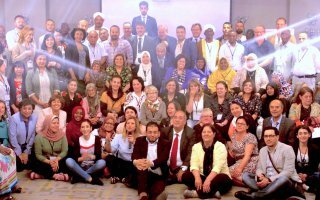 The meeting gathered more than 100 participants mainly from the MENA region and Eastern Europe, including national education coalitions, funding agencies, representatives of CSO, UN agencies and states, and media. For more information on the meeting please see here. For more information on privatisation of education please visit here. For more information on education in emergencies, please visit here. For more information on education financing, please visit here. Right to Education Initiative website is available in Arabic.